Acetamiprid primarily targets the central nervous system and may cause dizziness, headache and sedation as well as agitation, seizures and coma. A Toxicology Data Network article also notes that the harmful chemical may trigger the onset of cardiovascular conditions such as hypotension, ventricular dysrhythmias and even death. The entry adds that the hazardous compound may induce hypothermia, pneumonitis and respiratory failure. Likewise, acetamiprid is linked to an increased risk of nausea, vomiting and diarrhea as well as abdominal pain and severe eye irritation. 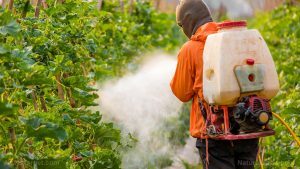 An article published on the Pub Chem website has also revealed that the insecticide may pollute water sources and impact aquatic flora and fauna. The hazardous compound is known to affect various animal species such as fishes, invertebrates and crustaceans. Likewise, acetamiprid is found to be detrimental to aquatic plants, algae and sediment-residing organisms. The harmful chemical is also toxic to birds, mammals, and other beneficial animals such as honeybees, arthropods and earthworms. Acetamiprid is notoriously harmful to the cardiovascular profile and the central nervous system. Likewise, the chemical affects the digestive tract, the eyes and the immune system. Acetamiprid is the primary chemical component of various trade name insecticides such as Gazelle, Insyst and Beticol, as well as Mospilan 20 SG and Antilop SG. The chemical comes in soluble granule formulation and is widely used across Europe and the U.S.
A material safety data sheet published on the Clear Synth website recommends using protective clothing, gloves and respiratory equipment to reduce the risk of direct chemical exposure. The data sheet also suggests that work spaces put up adequate ventilation to lower the odds of exposure. Likewise, the guidelines advise that people exposed to the harmful chemical should contact a poison control center or seek immediate medical attention. In addition, the data sheet stresses that people exposed to the harmful chemical be taken to an area with fresh air. Victims who had direct eye and skin contact are also advised to remove contaminated clothing articles and contact lenses and thoroughly wash the affected areas with plenty of water. People who ingested the toxic substance are discouraged from inducing vomiting. Instead, victims are advised to drink water or milk following chemical ingestion. Furthermore, the safety guidelines suggest that people immediately evacuate the area to avoid direct contact if an accidental spill occurs. Acetamiprid causes dizziness, headache and sedation as well as agitation, seizures and coma. Acetamiprid poisoning leads to hypotension, ventricular dysrhythmias and even death. Acetamiprid exposure may induce hypothermia, pneumonitis and respiratory failure. Acetamiprid affects the heart, the eyes, the central nervous system and both the respiratory and digestive tracts.